Deuces is the $32,000 Reserve Grand Crossbred boar at the 2014 World Pork Expo bred by Curry and Matt Allen. He was a standout at Expo for his presence, athleticism, and correctness of skeleton. When he came home from Expo his libido took over. He ranted out and got skinny and became tough to appreciate, so he was overshadowed and underused the first season. 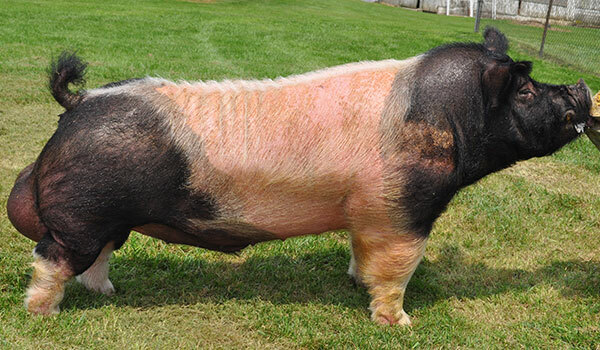 He has matured into an incredibly impressive boar and is gaining traction as a sire. We are seeing tremendous value in his correctness of skeleton and his ability to sire that. He is one that we’ve assumed will need to be taken to more muscle but we are finding that muscle will not be an issue. We can use Deuces on moderate sows that get on the borderline of too wide behind and he will correct their rear legs. We have just scratched the surface finding Deuces’s real value. He is now getting used on several elite sows across the country. Where most boars in studs see the most use in their first season and then fade out, I see Deuces becoming more popular with age and make a dominating run as an older boar. He is a MUST USE! !